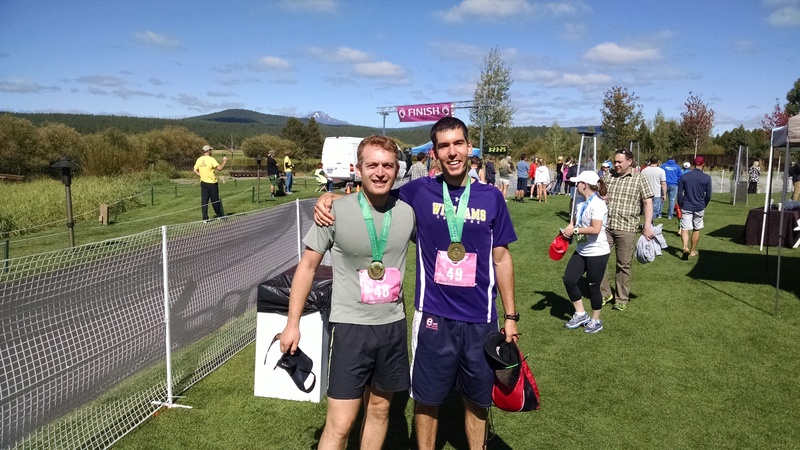 K4P Northwest Regional Director Jordan Goldwarg and Sam McVeety at the finish line of the Sunriver Marathon. Earlier this summer, Sam McVeety and I were thinking of innovative ways to fundraise for Kids4Peace Seattle. We decided to indulge our love of running and train together for a marathon, raising money and awareness for K4P along the way. While doing a marathon for charity is nothing new, we added a few twists by launching an Indiegogo campaign to help us with our fundraising. In true crowdfunding fashion, we offered some fun incentives to induce donations, including things like going on a training run with us (for a $200 donation), getting a cross-country ski lesson from me ($300), or getting some rowing lessons from Sam ($500). The campaign was a success, raising over $1700 for K4P Seattle! And the marathon was also a success: yesterday, we competed in the Sunriver Marathon near Bend, Oregon, finishing together in a time of 3 hours, 24 minutes, and 18 seconds. While the Indiegogo campaign is finished, people who want to support this effort can still make a donation directly to Kids4Peace. And if you want to take advantage of the incentives, we’re happy to oblige! Just email me at jordan@k4p.org after you make your donation.